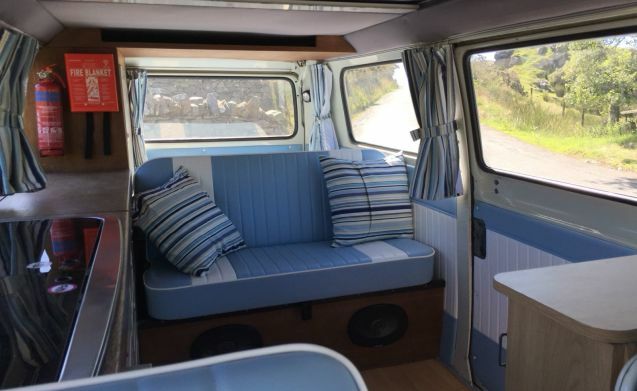 Starting at our base, just a few miles from Caernarfon and its historic castle your journey will begin, exploring Snowdonia, Lleyn Peninsular and all of the sights North West Wales has to offer. 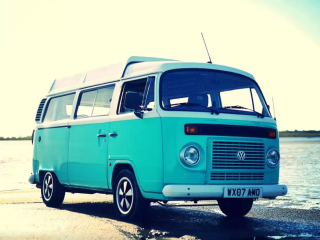 Nell is a right-hand drive, 1973 late Bay camper-van, painted in the same hue as the bluest of summer skies. 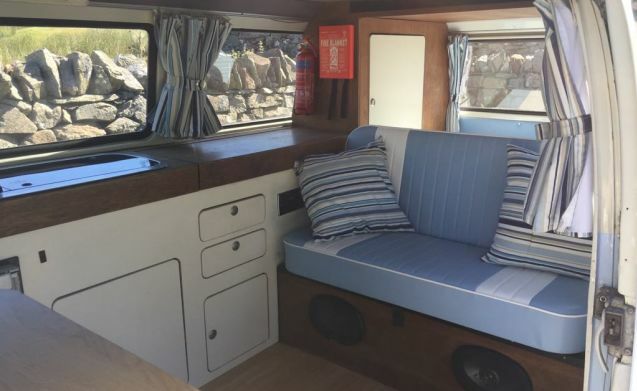 Nell has a well-planned modern interior with a hob, sink and fridge, ample storage, and all the cooking utensils you need to whip up a family feast. 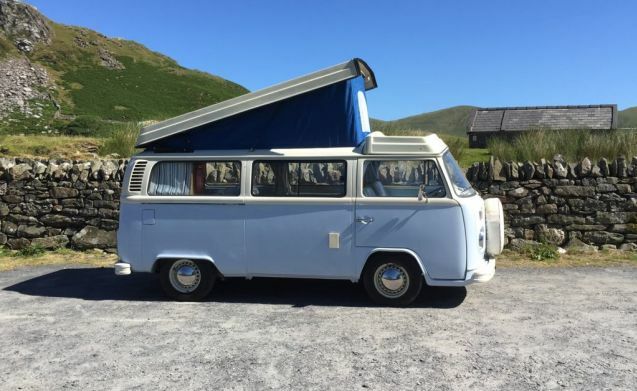 Nell is a 4-berth camper and can sleep 2 adults on her comfy ¾ width rock and roll bed and 2 children in her Westfalia style, pop up roof. 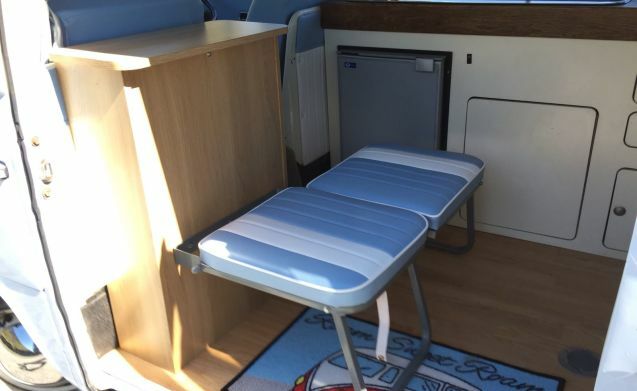 If you find you require further living and/or sleeping space, we also have an optional awning that can be hired to compliment your camper-van experience. 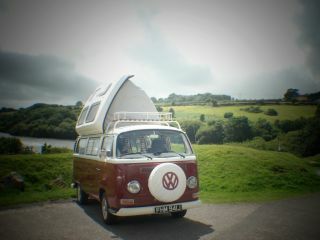 Life takes a slower pace in a 70s campervan, be prepared to drive a little slower, it's so you can take in the scenery! 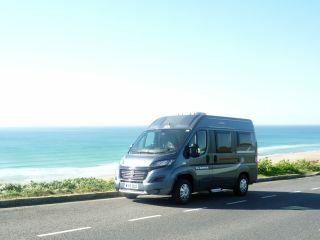 Campers are all about freedom and that is why we aim to be as flexible as possible with our holidays. When selecting your holiday dates we are happy to work to your itinerary where possible. Parking is available on the premises but at the owner's risk. Bookings require a non-refundable deposit of £150 (£50 for 1 day rentals). The remainder of the booking fee is due 4 weeks before the start of the holiday. Dogs are welcome with a £25 one off charge. 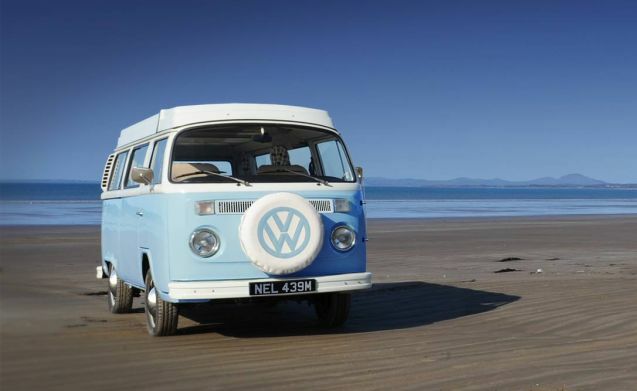 Our campers are covered by UK standard vehicle insurance. 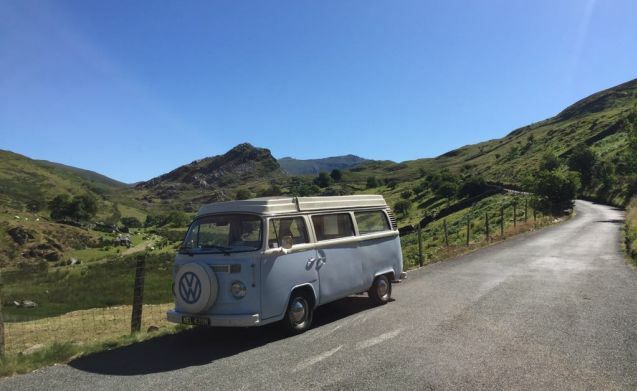 You can drive one of our campers if you have held a full UK / EU / USA / Canadian / Australian or New Zealand drivers licence for 2 or more years and are between 25 years and 70 years old and of sound health. Please note, if you have any driving offences / convictions we may not be able to authorise your hire as they could result in the vehicle not being insured. The cost of hire includes insurance for 1 driver. Extra drivers are £10 per driver. A £500 security deposit will be required on the day of collection. This will be returned 3-5 days after your holiday upon the safe return of the camper. If you are unable to make the holiday you have planned, the deposit of £150 made at the point of booking is non-refundable. However if you cancel outside the six-week period prior to the start of your hire we will refund you the remaining balance, having paid in advance. Cancellations less than 42 days but more than 14 days before the rental period commences you will forfeit 50% of the total cost or full deposit, whichever is greater. If cancellation is within 14 days then there is no refund. 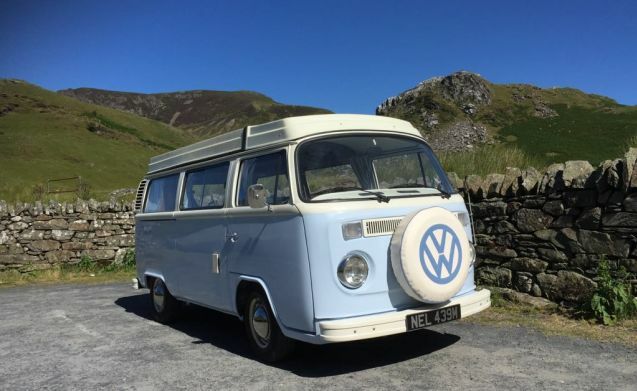 However, if we do manage to get another booking for the same campervan, for the same rental period we will waive the cancellation fee but not the booking deposit. Enjoy, relax & chill out!